First place will win a copy of The Body Finder, plus some awesome signed swag. 5 Runner-ups will win some signed swag. And since I'm using The Book Depository for this, the book giveaway is INTERNATIONAL. The swag prize packs are US only. To enter, you must fill out this FORM.. Winners will be picked through Random.org, announced on my blog and emailed. If you win, you have 48 hours to email me your information. If you fail to do so, an alternate winner will be announced and contacted. Since I am using the Book Depository, please make sure the Book Depository will ship to you before entering. Contest end 04/12 at 11:59PM CST. Thank you for holding this wonderful giveaway. 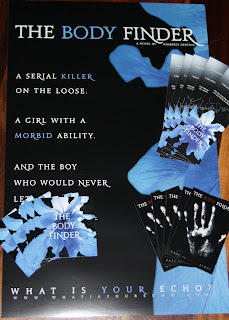 I've been wanting to read The Body Finder and all the swag looks amazing! This is your street team pack, isn't it? The Body Finder is fabulous! I hate waiting a year for the sequel. And thanks for entering, everyone! @Catie- Yeah, it's the street team stuff. I don't know how I'm going to send the posters. The solution will come to me, haha. Wow thanks for the giveaway nice blog! I'm from north america so how does that qualify?